All transactions are safe and secure with a reliable history in online purchasing behind each of our associates. 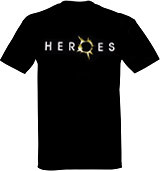 Buy the Heroes t-shirt to own Heroes clothing and merchandise. The front of this dark tee features the Heroes TV show logo printed across the chest. The design displays the title of the show, with an image of a solar eclipse replacing the letter 'O' in the title. These Heroes t-shirts are available in five different sizes, and they make the perfect gift for any fan of the science fiction TV series. Match it with Heroes hats. In addition to the Heroes tee above, browse the Heroes Clothing Gallery for more apparel like men's and women's clothes, kids shirts or hoodies.